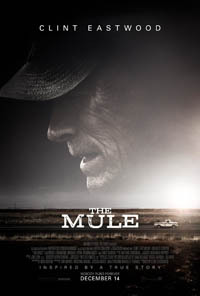 Clint Eastwood is both playing the main character and directing this movie. Very impressive indeed for an 88-year-old man and legend. Earl Stone has always focused on his work and neglected his family. His relations to his ex-wife and daughter are very bad. When he fails to adapt to the internet age, he loses his flower business too. He is offered a job transporting cocaine for a mexican drug cartel and soon he is making good money while enjoying life at the same time. Bradley Cooper is a DEA Agent who is trying to locate and stop the drug traffic. There is not a lot of action and the movie is very slow, but it is never boring. A lot of scenes and lines make you smile and Clint's Earl Stone may be old and egoistic, but he is easily likeable and not quite as grumpy as many of Clint's other movie characters. The movie is enjoyable and worth watching, just don't expect a masterpiece and be willing to accept the slow tempo.